I am here at Nortel R&D headquarters in Ottawa, Canada where the Nortel incubation team is showing us a bunch of the latest technologies they are working on in the labs. This is the first day the media has been allowed to see the next-gen products the Canadian-based communications company is working on. 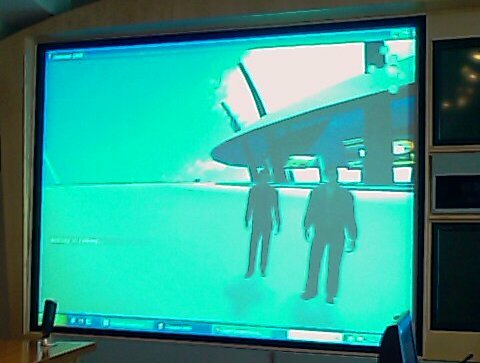 We are an hour or so into the demo and so far we have seen a Nortel specific virtual world where all avatars use their corporate identities. In addition, there is voice collaboration with 3D stereo built-in. If this sounds familiar it is because Diamondware has similar technology. Nortel cannot comment on whether they are working with the Arizona-based company but regardless (I would say they are working together and even will even potentially buy the company), the demo was impressive as it reinforces how the quality of audio really is more important than we realize. We use a single ear to listen to one another while on the phone and we compress the audio and filter out most of the feeling. The wizards in the Nortel labs showed us a demo of the difference between CD quality audio and typical phone quality audio. There IS a difference and until you compare the two you don't realize it. The divergence is likely similar to the difference of flying with noise cancelling headphones. You don’t realize how much better it is until you try it for yourself. Nortel thinks that Second Life is great but it is not a business environment per se. This is why they are working on a secure enterprise virtualization environment. They truly believe that telephones will be replaced by virtual world communications which is richer and has visual cues allowing you to see if others are paying attention, etc. This would mean you can communicate visually regardless of device. Avatars in fact are preferable to live video in many cases as there are times you are working at home and your attire does not lend itself to coworker meetings via video. I didn’t mention that there is proximity based audio as well meaning you can communicate with the person next to you while listening to a keynote address at the same time. Again, this is very much like technology from Diamondware. Internally this effort is called Project Chainsaw -- there is no official name as there are trademark applications in the works. My take so far is that virtual worlds absolutely have the potential to change voice communications. This could be just a single avenue that changes the landscape of telecom. You may recall I have written about how virtual worlds will change commerce in the future. I asked if Nortel believes this is the case and they said yes but at the moment ecommerce sites do not want to send people to another site like Second Life. This is why Project Chainsaw makes sense for the enterprise. I know many bloggers have been down on voice as they say there is nothing exciting happening in the space. How can they say this when virtual worlds are becoming the newest environment leveraging voice for virtual and social interactions? We may have seen the future of voice communication. By the way, Nortel is not the first company to be pushing this idea of virtual worlds but what I have noticed is they realize virtual worlds need to be safe, secure and accepted by CIOs. This is just one area where they differentiate themselves. It will be very exciting to see how this new paradigm (yes it is an over-used word but appropriate) changes how we communicate electronically. \nI am here at Nortel R&D headquarters in Ottawa, Canada where the Nortel incubation team is showing us a bunch of the latest technologies they are working on in the labs. This is the first day the media has been allowed to see the next-gen products the Canadian-based communications company is working on. \nWe are an hour or so into the demo and so far we have seen a Nortel specific virtual world where all avatars use their corporate identities. In addition, there is voice collaboration with 3D stereo built-in. \nIf this sounds familiar it is because Diamondware has similar technology. Nortel cannot comment on whether they are working with the Arizona-based company but regardless (I would say they are working together and even will even potentially buy the company), the demo was impressive as it reinforces how the quality of audio really is more important than we realize. \nWe use a single ear to listen to one another while on the phone and we compress the audio and filter out most of the feeling. The wizards in the Nortel labs showed us a demo of the difference between CD quality audio and typical phone quality audio. There IS a difference and until you compare the two you don't realize it. \nThe divergence is likely similar to the difference of flying with noise cancelling headphones. You don’t realize how much better it is until you try it for yourself. \nNortel thinks that Second Life is great but it is not a business environment per se. This is why they are working on a secure enterprise virtualization environment. \nThey truly believe that telephones will be replaced by virtual world communications which is richer and has visual cues allowing you to see if others are paying attention, etc. This would mean you can communicate visually regardless of device. \nAvatars in fact are preferable to live video in many cases as there are times you are working at home and your attire does not lend itself to coworker meetings via video. \nI didn’t mention that there is proximity based audio as well meaning you can communicate with the person next to you while listening to a keynote address at the same time. Again, this is very much like technology from Diamondware. \nInternally this effort is called Project Chainsaw -- there is no official name as there are trademark applications in the works. \nMy take so far is that virtual worlds absolutely have the potential to change voice communications. This could be just a single avenue that changes the landscape of telecom. \nYou may recall I have written about how virtual worlds will change commerce in the future. I asked if Nortel believes this is the case and they said yes but at the moment ecommerce sites do not want to send people to another site like Second Life. This is why Project Chainsaw makes sense for the enterprise. \nI know many bloggers have been down on voice as they say there is nothing exciting happening in the space. How can they say this when virtual worlds are becoming the newest environment leveraging voice for virtual and social interactions? \nWe may have seen the future of voice communication. \nBy the way, Nortel is not the first company to be pushing this idea of virtual worlds but what I have noticed is they realize virtual worlds need to be safe, secure and accepted by CIOs. This is just one area where they differentiate themselves. \nIt will be very exciting to see how this new paradigm (yes it is an over-used word but appropriate) changes how we communicate electronically.